How do we avoid deception in these last days? Doug Harris: First Timothy 4:1 warns the believer to pay attention so as not to be deceived by deceitful spirits and doctrines of demons. It becomes very obvious if people pay attention to these things that sooner or later they will want to communicate with these evil spirts and will want to draw closer to that which is deceitful — the doctrine of demons. Just how can we test out what is truly from God and what is taught by demons when things are spoken of concerning the End Times. How can we begin to test these things out? What can we do to insure that we are not led astray? The answer is clear — we certainly need to bring everything back that we've heard to the Word of God. If what's being said is clearly found within the Word of God, then there is absolutely no problem with that end times teaching. If, however, what you've learned is not found within the Word of God, but it's also not denied by the Word of God, well we might not be able to be so sure. We end up holding those teachings up and conclude they're probably true, but debatable. Stand strong on the belief that anything that is not clearly taught within Scripture, or is clearly denied by Scripture, means we cannot build our future upon it. We need to be discerning. The Bible advises us to be diligently seeking. I hope that's something we always do from the Scriptures and with others. However, even at this point we are not left helpless, because 1 Timothy 4 goes on to give the antidote to avoiding deception and the accepting of wrong teachings. The answer is that we are to be nourished by the words of faith and of sound doctrine. Just how vital is that today? How should we be living in these days? Nathan, what do you have to say? In 1 Timothy 4:6, we get in the King James this phrase about being "nourished." I'm very interested in that phrase. Just how are we to be nourished in these last days? When I think of nourishment, I'm reminded that nourishment always gives you strength. Nourishment always gives you the ability to do things. We as believers in Christ are going to face difficult days. We are in fact even now facing difficult days, knowing that we are going to face even more difficult days to come. How do we get nourished and be able to face them? Nathan Jones: The Apostle Peter gave us a great description of what being nourished looks like. Second Peter 3 is an entire chapter dedicated to talking about living in the "last days" or "latter days." Peter gives us ten points that we can follow to be nourished and to exist wholly in these last very difficult days. 1. Peter tells us to recall the words spoken in the past by the holy prophets and the commands given by our Lord and Savior through the Apostles. We should remember the words of Jesus. Remember the words of the Apostles. In other words, read your Bible! 2. Understand that in the last days scoffers will come. Peter was telling us that in the last day people would declare that Jesus isn't coming back. They'll claim such a belief is nonsense and not to believe in it. They'll scoff at the Bible. They'll scoff at God even existing. And, they'll scoff at primarily the Creation story. In other words, Peter is prophesying the advent of the teaching of Evolution. 3. Peter warns us not to forget God's promise that He'll return. We are to abide in His salvation and model His patience. That Jesus is so patiently waiting for everybody who is supposed to in this age come to know Jesus Christ as Savior and get saved demonstrates God's amazing love. 4. Peter reminds us to live holy and godly lives. While we are here on this earth, as Christians we are to live holy and godly lives while we wait for Christ's return. 5. Look forward to the day of God. Look forward to the time when we live with God up in Heaven with dwell with Him forever. That's really something to look forward to! And, it will give you hope and perspective. 6. Speed the Lord's coming, Peter says. In other words, get the Gospel out. Share the Good News with people so they may hear the Word of God and get saved. Time is short, so be active in evangelism. 7. Look forward to the New Heaven and New Earth, which is the home of the Righteous. We are here in this world only temporarily. This here is a temporary home. Our real home, though, is the New Jerusalem. That's Heaven! Heaven will come down to earth one day so that God will dwell with redeemed Man. Such knowledge gives us believers great hope and something to look forward to. 8. Peter says we are to be found spotless and blameless and at peace with God. Again, live those holy and spotless lives, but strive to live at peace with one another. Christians are an ornery bunch, but we need to practice peace with one another now, for we'll be spending eternity with each other later. 9. We need to be on guard so that we many not be carried away by the error of lawless men. During the Last Days, one of the main signs that Jesus gave is that we would know His soon return is coming due to the proliferation of false prophets and false teachers. That's why Peter warns the Christian to be on our guard and be prepared for battling doctrinal error. To be able to do that, we need to know our Bible so that we can refute the false doctrines that are being taught. 10. The last nourishment Peter gives us is the directive to grow in the grace and knowledge of our Lord and Savior Jesus Christ. Grow in the grace of God and become more Christlike. That there is the ten "nourishments" Peter gives. Doug Harris: Brilliant, brilliant info! Two points came out to me there. It's sort of like you almost were talking about both a looking back and looking forward. We are to look back to what God has said in His Word; never forgetting what He said, never forgetting what's written down, and never forgetting what's there. But, also, wherever we are, we're to be looking forward to what is yet to come. As Paul had said, this difficult time that I am going through now is nothing compared to what glory is to come. So, Peter is giving us two directions to pay attention to: looking back and looking forward. That's very important. Nathan Jones: Amen! As difficult as the world is now for Christians to live in and growing worse every day with the massacres in Nigeria, the concentration camps for Christians in North Korea, and the loss of our freedoms in the Western world; it's going to get worse. Conditions are going to get worse because evil hates God. Evil hates the thought that we represent God and so wants to destroy our belief in Christ. But, Jesus says that even as bad as it is now and how tough our last days time period is, it's nothing compared to the last of the last days, which is the coming Tribulation. Doug Harris: Wonderful words! I hope all believers understand the need to be nourished by the Bible's words of faith and sound doctrine. 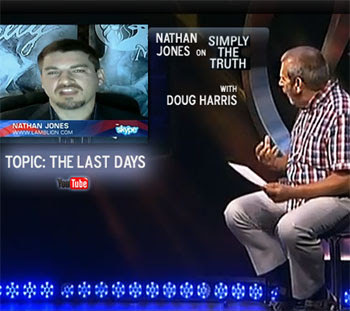 In the third part of this interview on End Times Truth, we will discuss what worldly fables lead us away from the truth of Jesus Christ. Lets all remember to pray for the peace of Jerusalem every day! Amen somebody!!! Another sign of the times? The Boy Scouts going gay. Article: "Peter warns us not to forget God's promise that He'll return. We are to abide in His salvation and model His patience. That Jesus is so patiently waiting for everybody who is supposed to in this age come to know Jesus Christ as Savior and get saved demonstrates God's amazing love." For me this is the hardest part. I hope the Lord understands why some of us want Him to return quickly. We just want to be with Him so much. Billy, good news on the Boy Scouts front. My son's a scout. The councils have a standing response to say they're discussing gays in the Scouts, but they've already decided ahead of time that it's a no. Some individual troop leaders may try to wander, but I cannot see them being accepted into the councils anymore. At these boy's ages (12-17), there shouldn't be any who are gay anyway, other than a forced perception from homosexual activists. Their strategy is to target teens or at least to bring down the Scouts through division by internal strife over the topic. Purely satanic strategy. Great news! Glad your son wont be subjected to the LGBT evil. Christians are living The Last Days. Everyone else are living The Lust Days. Great article Nathan and great news for the scouts. Also read some great news for Susie and Billy, congratulations. Yes Susie we pray for Israel everyday.